S5 Ameritage Medical - September template medical subjects from the design studio Shape5. Quality design layout with support for adaptive layout, provides full support for various mobile platforms. You can select a background image for the top and bottom of the site, determining the colors of the template by selecting one of the main colors, and more. Studio platform S5 Vertex framework template gives fast download speeds. and provides full access to all key parameters layout control via built-in template manager. Having a flexible menu S5 Flex Menu allow optimal place all information and build easily navigate through the site. 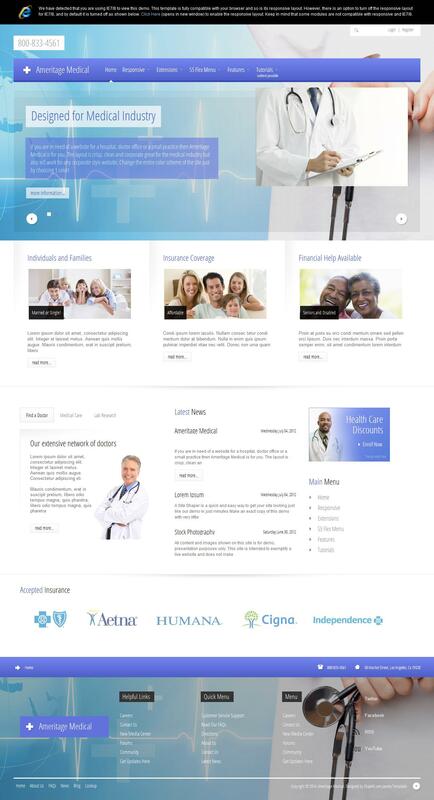 S5 Ameritage Medical is perfect for creating corporate cards and sites of medical institutions.